You are here: Home » 10,000 Comments!! 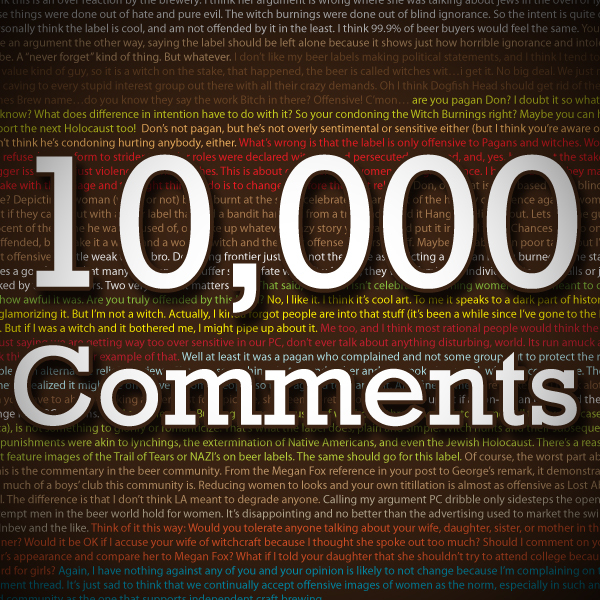 We’ve officially hit 10,000 comments here on the blog! I retried Dragons Milk (because of you and Don) and it went from Ehhh to Yumm. Sometimes we’re just not in the mood for a particular beer. No matter how good it is. 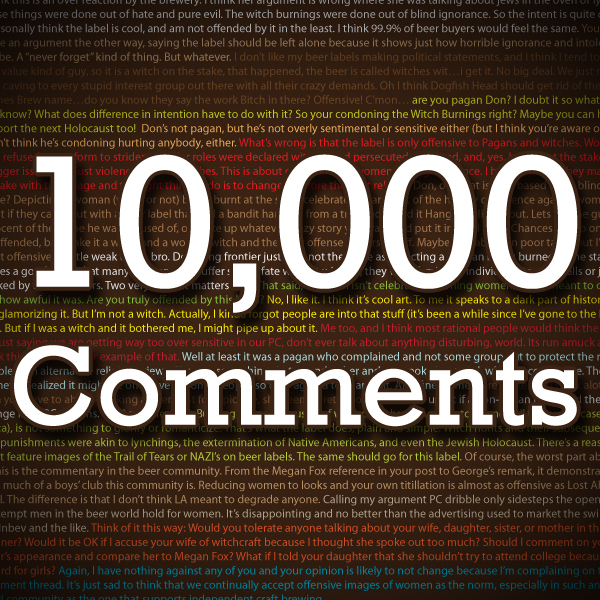 Not only is that the 10,000th comment, it’s also sage advice! This is a big milestone for Don and I, because it reflects what we like best about the site – it’s a community where folks like you freely exchange thoughts and opinions. We’ve had some pretty heated debates (this one in particular) but I can only recall one or two instances where someone said something truly out of line. That’s pretty good for a site about booze, especially one Daniel comments on! Anyway, we just want to share our excitement and to say thanks to each of you who has taken a moment to share your expertise, your point of view and your love of beer and whiskey. ← Founders Nemesis 2010: On Second Thought, Yuck! Congrats Don and Jim. Please let me know when you reach 24,999 and I’ll post the winning comment! Free beer from your respective bunkers, right? If that’s the case, I’m gonna be number 25,000 – You should see that bunker out there in Idaho! Very cool indeed! Not a surprise really on one of the best beer sites on the web! Congrats! Yeah, that Lost Abbey label controversy one was the first time I commented here (or so I believe). This is some good stuff. You guys do a great job of writing posts that encourage discussion as opposed to telling everyone what’s good and what’s not. Thanks, Zac. Yes, I almost mentioned that’s where we picked you up as a reader. It’s kind of a shock you stuck around because of what a buffoon Don was being at the time, but he’s a lovable buffoon, and perhaps that’s all we can ask for. Honestly, I commented at several blogs, but this was the only place a discussion actually took place and there was room for my perspective as well as Don’s buffoonery. (I kid. I kid.) I think because you all engage every comment makes this a place to return over and over. Well Zac, being from Idaho and wearing flannel all the time, I really couldn’t see where that label might have been offensive. I thought some were perhaps over sensative, and I was in my bull in a china shop kinda way trying to lighten toe tone. But now through blog therapy and edjumacatikon I have come to realize that people who are over sensitive have a right to their wrong opinions, and I need to embrace their over sensitivity as diverse and culturally aware. I think I’ll go back into my cave now…that is all. This flannel is gettin’ scratchy.. Spoken like a true buffoon, Don. Nice. Don, I appreciate your comments, because I think you actually think about it instead of just spouting off. Also, there’s balance here because you both comment and bring different perspectives to the table. Besides, I wouldn’t expect anything different from a guy who lives in a place where blue turf is considered a good idea. Thanks, Jim. I was going to type “#zing” but it holds more weight coming from someone else. Ha! I forgot about that field in Alaska. I did see the ESPN feel-good segment on it. No Dales, No KBS, No Stagg, No Notthin???? Alas your admiration will have to be enough. Congrats on the Blogs success and keep up the good work! Dang! I missed it by one minute and one comment! Congratulations, guys! Thanks for all the work you put into your posts and your attention to the comments section. It really sets you apart from the rest of the beer/whiskey bloggeratti! Thanks Alex, and great use of Bloggeratti. Now if I can just get past the security I can get my pics of Booker Noe in his swim suit! Thanks for your kind words Jorge. It is hard to believe that after a year and a half that we are still as committed and having as much fun with it, but we are, and it is the people we meet and get to interact with that make it fun and worth while for us. Thank You for being here for us! Way to go Bros! A well deserved milestone. And you’re so right… you have a great not so little community thing going here. Yo G-Lo, Thanks. We’re having a good time doing this and it is people like yourself that make it so much fun for us.